Hearts have bolstered their defensive options by signing Slovenian international Andraz Struna. The right-back, 27, has joined until the end of the season, after leaving Greek outfit PAS Giannina, Hearts confirmed. Struna made his Slovenia debut in 2012 and has earned 25 caps for his country. "I'm an attacking full-back and I think I'll be a good fit based on the ideas presented to me by the club and the head coach," he said. 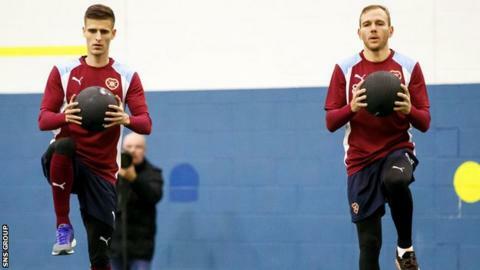 "I like possession football and I understand that is the way Hearts want to play, so I am optimistic." Head coach Ian Cathro has been seeking to add to his defence after Igor Rossi left Hearts to join Saudi Arabian side Al-Faisaly Harmah. Hearts also lost Alim Ozturk to Turkish club Boluspor, while full-back Callum Paterson is out for the rest of the season with knee ligament damage and Faycal Rherras will be at the Africa Cup of Nations with Morocco. Meanwhile, Paterson has undergone surgery on the knee injury he sustained in the 4-0 win over Kilmarnock on 27 December. Scotland cap Paterson, 22, will be out of contract in the summer and scored 10 goals in 24 appearances this season.